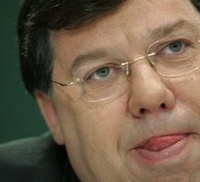 Political condemnation of the coalition government in Dublin has increased after it emerged the 26-County Taoiseach Brian Cowen held previously undisclosed meetings with the former principal of the fraudulent Anglo Irish Bank in 2008 prior to the public emergence of the banking crisis. A collapse in the share price of Anglo Irish Bank and a run on deposits preceded the government’s controversial bank guarantee, which was subsequently extended to a bailout for the bank’s international investors to the tune of tens of billions of euro. It emerged at the weekend that Mr Cowen had received a phone call from the then Anglo Irish Bank chairman Sean FitzPatrick in March 2008, and that he attended a dinner and also played golf with Mr FitzPatrick in July that year. The two contacts occurred in 2008, some months before the Government guaranteed all the deposits and bonds of the State’s main financial institutions. Taoiseach Brian Cowen told the Dublin parliament on Wednesday there was ‘no question’ of any inappropriate contact between him and FitzPatrick with regard to the bank’s situation in 2008. In response to a question from Sinn Fein’s Caoimhghin O Caolain, Mr Cowen also confirmed that other individuals were also present at the dinner with Mr FitzPatrick. Those people were Garry McGann, who was a director of Anglo at the time, and Alan Gray, an economic consultant who was on the board of the Central Bank. Cowen has now extraordinarily denied there was any discussion of Anglo Irish Bank during these events. Cowen also denied that he was requested by Sean FitzPatrick to pressure the National Treasury Management Agency to invest in Anglo Irish Bank, pressure which the agency has independently confirmed. Mr Cowen said there was “no question of any inappropriate behaviour” by him, either as Minister for Finance or as Taoiseach and he wished to refute any suggestion that there was an “untoward relationship” whereby his party had protected Anglo or big business. Mr Cowen said he had played golf with Mr FitzPatrick on July 28th 2008. He did not play much golf and had not played with Mr FitzPatrick either before, or since. “That game took place. I didn’t discuss Anglo Irish Bank with him throughout that period at all,” Mr Cowen said. The decision with regard to the guarantee of Anglo by the 26-County state was done because it was of systemic importance and not cronyism or corruption, he insisted. “No game of golf and no phone call and no dinner will change that situation,” Mr Cowen added. It was an “absurd conspiracy theory” to suggest any impropriety. Mr O Caolain said that the Taoiseach’s credibility was “in tatters” after his latest admissions. “We are expected to believe that the chair of Anglo-Irish, one of its directors, a director of the Central Bank and the Taoiseach met and did not discuss the affairs of Anglo. “What sort of regulatory regime was in place when a director of the Central Bank and IFSRA consorted socially with these senior figures in one of the most corrupt banks in the world? Labour Party leader Eamon Gilmore said that on ‘every previous occasion’ the Opposition parties had asked Mr Cowen the state of his knowledge about Anglo, he had not revealed his contacts with Mr FitzPatrick. He said he would nearly blame Mr Cowen more if he had not discussed the Anglo position with Mr FitzPatrick during those 2008 contacts. Mr Cowen was leading people to believe that there had been in some way a “Chinese wall” constructed down the golf fairway when he played golf with the Anglo chairman. However, Fianna Fail’s junior coalition partners, the Green Party, has insisted it has been unable to find any evidence of inappropriate behaviour in the meetings. He also said it was regrettable that at every Green party think-in, a policy-driven party is forced to talk about other issues, such as ‘golfgate’, or ‘garglegage’, the controversy surrounding Mr Cowen’s slurred interview with Morning Ireland after a late night in Galway. But Sinn Fein Dail leader Caoimhghin O Caolain branded Mr Gormley’s response pathetic. “There seems to be nothing that Fianna Fail can do that will prompt the Greens to leave Government,” he said. “On the Opposition benches in the last Dail the Green Party were loud in their condemnation of the Golden Circle of conservative politicians and developers that was running the economy into the ground. Sinn Fein President Gerry Adams said Fianna Fail’s cosy relationship with speculators, developers and bankers such as Sean Fitzpatrick underpinned the need for root and branch reform of the political and economic systems. “While the Taoiseach’s golf outing with Sean Fitzpatrick dominates the political news the government will be drawing down the first of the loans from the EU/IMF dig out.